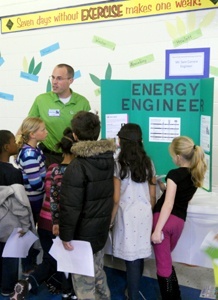 Lime Energy’s Lead Energy Engineer (East), Samuel Carrara, PE, MBA, LEED Green Associate, presented information about the field of Energy Engineering at the Science and Technology Career Fair at Mallard Creek Elementary School in Charlotte, North Carolina. Sam spoke about energy savings from LED and compact fluorescent lamps versus incandescent lamps. The kids also learned about newer showerheads that save water and heating energy. This summer Sam will be teaching elementary and middle school children about energy savings during Junior Achievement summer camps in Charlotte, NC.